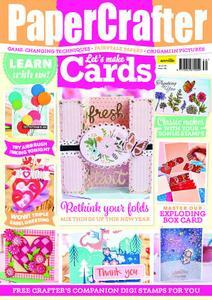 Issue 130 of PaperCrafter pdf magazine is brimming with unique techniques and card projects for the new year ahead. Take a masterclass in galaxy inked backgrounds, discover partial die-cutting or why not up your heat embossing game with our expert-led guide? Plus, we reveal our top ways to scrapbooking success! As always, we have lots of freebies on offer including your bonus fairytale paper pull-out, 84 Crafter’s Companion digi stamps and a 30-piece Rare Earth spring stamp set.